For decades, ex-government agent Raymond “Red” Reddington (James Spader) has been one of the FBI’s most wanted fugitives. Brokering shadowy deals for criminals across the globe, Red was known by many as “The concierge of Crime.” Now, he’s mysteriously surrendered to the FBI with an explosive offer: he will help catch the world’s most elusive criminals, under the condition that he speaks only to Elizabeth “Liz” Keen (Megan Boone, TV’s “L..
For decades, ex-government Raymond “Red” Reddington (James Spader) has been one of the FBI’s Most Wanted fugitives. Last season, he mysteriously surrendered to the FBI but now the FBI works for him as he identifies a “blacklist” of politicians, mobsters, spies and International terrorists. He will help catch them all... with the caveat that Elizabeth "Liz" Keen (Megan Boone, TV's "Law & Order: Los Angeles") continues to work as his part.. In the third season of the hit drama "The Blacklist," FBI Agent Elizabeth "Liz" Keen (Megan Boone) is now a fugitive and on the run with criminal mastermind Raymond "Red" Reddington (James Spader). With Assistant FBI Director Harold Cooper under investigation, a conflicted Agent Donald Ressler leads the FBI Task Force on a massive manhunt for Liz and Red. As they struggle to stay one step ahead of their former colleagues, Liz immerses h..
Liz works to resolve the mystery of her lost childhood, but every day without the truth holds more danger for her and her family. Meanwhile, the Task Force reels from Liz's resurrection and friendships are fractured. Betrayed by those closest to him, Reddington's specific moral code demands justice, all the while battling an army of new and unexpected blacklisters.Special Features A Darker Shade Of Red, Deleted Scenes & Gag Reel, Mr K..
Own The Blacklist Season 4 DVD from Deff, DVD, Blu-Ray & 4K Video Specialists - Free UK Delivery.. 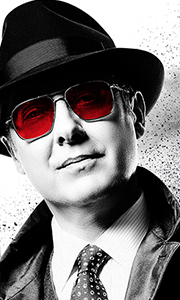 The Complete First Season: For decades, ex-government agent Raymond "Red" Reddington (James Spader) has been one of the FBI'S most wanted fugitives. Brokering shadowy deals for criminals across the globe, Red was known by many as "The Concierge of Crime." Now, he's mysteriously surrendered to the FBI with an explosive offer: he will help catch the world's most elusive criminals, under the condition that he speaks only to Elizabeth "Liz"..
Own The Blacklist Seasons 1 to 2 DVD from Deff, DVD, Blu-Ray & 4K Video Specialists - Free UK Delivery..
For decades, ex-government agent Raymond “Red” Reddington (James Spader) has been one of the FBI’s most wanted fugitives. Brokering shadowy deals for criminals across the globe, Red was known by many as “The Concierge of Crime.” In Season 1, he mysteriously surrenders to the FBI with an explosive offer. In Season 2, the FBI is working for him as he identifies some of the world’s most elusive criminals, with Agent Elizabeth “Liz” Keen (M..
Own The Blacklist Seasons 1 to 3 DVD from Deff, DVD, Blu-Ray & 4K Video Specialists - Free UK Delivery..
Own The Blacklist - Redemption Season 1 DVD from Deff, DVD, Blu-Ray & 4K Video Specialists - Free UK Delivery.. Feeling surprisingly unencumbered, Raymond Reddington (James Spader) is back, and in the process of rebuilding his criminal empire. His lust for life is ever-present as he lays the foundation for this new enterprise - one that he'll design with Elizabeth Keen (Megan Boone) by his side. Liz finds herself torn between her role as an FBI agent and the temptation to act on her more criminal instincts. In a world where the search for Blackli..
Own The Blacklist Seasons 1 to 4 DVD from Deff, DVD, Blu-Ray & 4K Video Specialists - Free UK Delivery..